CAIRO – This week’s presidential election in Egypt is not about who wins – that was settled long ago – but about how many people bother to cast ballots. Authorities hope that enough people will vote for President Abdel-Fattah el-Sissi to lend legitimacy to an election in which the only other candidate is an obscure politician who has made no effort to challenge him. 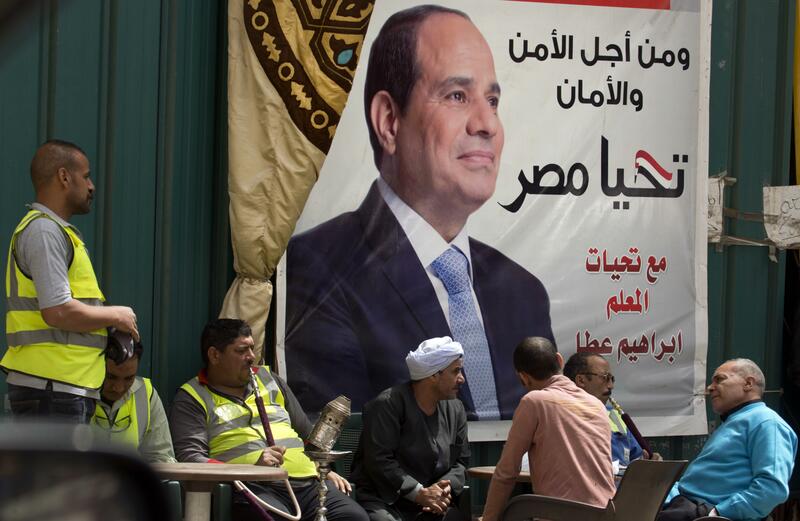 The streets of Cairo are lined with campaign banners and posters extolling el-Sissi, most put up by businessmen or organizations hoping to advertise their support. El-Sissi has done little in the way of traditional campaigning, and has not publicly mentioned his ostensive challenger, Moussa Mustafa Moussa. Instead of addressing any of the scores of rallies held by his supporters or appearing in TV ads, el-Sissi has opted for carefully scripted and televised functions. The former general has donned his military fatigues on recent occasions, highlighting the war on Islamic extremists and perhaps reminding voters that he led the military overthrow of a divisive Islamist president in the summer of 2013. Many Egyptians welcomed the overthrow of Mohammed Morsi and the crackdown on his Muslim Brotherhood, and for a time el-Sissi enjoyed a wave of popular support bordering on hysteria, with downtown shops selling chocolates with his portrait on them. The insurgency in the Sinai Peninsula, which gained strength after Morsi’s overthrow and is now led by the Islamic State group, has only grown more ferocious, with regular attacks on security forces and deadly church bombings. An assault on a mosque in November killed more than 300 people – the worst terror attack in Egypt’s modern history. As a result, most of the local media coverage of the election has consisted of el-Sissi delivering televised speeches and attending official functions, with little mention of politics. El-Sissi cultivates the image of a folksy populist, going on at length about his devotion to God, his reverence for his late mother, and his love for Egypt. In a one-hour TV interview that seemed more like an infomercial, el-Sissi said he wished he had one or two trillion dollars of his own money that he could spend on modernizing the country. But Ahmed Shafiq, a former air force general who narrowly lost the 2012 election to Morsi, withdrew after he was deported from his self-imposed exile in the United Arab Emirates, met by security men at the Cairo airport and whisked away to a hotel. Khaled Ali, a prominent human rights lawyer involved in the 2011 uprising, said he quit the race after authorities harassed and intimidated his supporters. Mohammed Anwar Sadat, a former lawmaker and the nephew of assassinated President Anwar Sadat, declined to run on similar grounds. At a ceremony last week in honor of Mother’s Day, celebrated at the start of spring in Egypt, el-Sissi urged people to cast ballots, saying it would be a “great and respectable thing” even if they voted “no.” It was probably a slip of the tongue, but pointed to the reality of the election, which resembles the yes-or-no referendums held by Mubarak and other Arab autocrats going back decades. Published: March 25, 2018, 8:57 a.m.